This ain't your typical Brazilian steakhouse. Paulista’s snack game is strong, including acai bowls (left) and coxinhas, fritters filled with chicken. In 1995, the United States nabbed its first Brazilian steakhouse chain, and, understandably, Americans went crazy for the concept of all-you-can-eat meat. Two decades later, Brazilian food still feels more or less synonymous with steak carved tableside here in the Bay Area. Brazil's culinary narrative is actually far more complicated, informed by waves of migration — the Portuguese, Japanese, Italians, Lebanese, Syrians, Palestinians, and other groups all put their stamp on Brazilian cuisine and culture. This is especially true in the cosmopolitan melting pot of São Paulo, which is where Oakland's Alex Yamamoto was born. Yamamoto lived in Brazil for 19 years before moving to Japan, opening his first Brazilian restaurant, meeting his wife, and then following her to the United States. In Oakland, he met avid craft beer nerd and fellow Glenview Elementary parent Jesse Madway. After years of talking about the sort of restaurant they wished their neighborhood of Glenview had — relaxed, family-friendly, with a top-notch beer list — they decided to open it themselves. The result is Paulista Brazilian Kitchen & Taproom. What makes Paulista a destination spot is its approach to Brazilian food. Instead of bringing more steak to Oakland, Yamamoto highlights everyday Brazilian dishes — the sort of fare locals would eat at home or on the street. In the mornings, Paulista feels like an airy cafe and low-key co-working space. Red Bay Coffee, freshly blended juices, and empanadas are all on offer, though the acai bowls are justifiably popular. Since the acai berry has been co-opted by the health food movement, it's easy to forget these smoothie bowls have genuine roots in Brazil. At Paulista, they're densely creamy, topped with granola and fresh fruit. More options are added as the day progresses, culminating in a sizable dinner menu that Yamamoto continues to grow. For the most part, you're looking at a few salads, entrées, and street food-style small plates. I loved the coxinhas — teardrop-shaped fritters filled with shredded chicken, parsley, and cheese. They're smaller than most other coxinhas you'll find in the Bay Area, but they achieve golden brown, crispy excellence and come with a deliciously sharp cilantro dipping sauce. That sauce comes with a number of the street snacks, such as the esfihas, small flatbreads brought to Brazil by Lebanese and Syrian immigrants. They taste like mini-pizzas, particularly the version topped with mozzarella and parmesan. The pão de queijo, freshly baked, cheese puffs made with tapioca flour, deliver wonderful flavor and a chewy, mochi-like texture. The empanadas, however, were hit-and-miss. A version filled with ground beef, tomatoes, and olives was surprisingly bland and unevenly cooked: about half the empanada was nice and flaky, the other half dry and doughy. The palmito, a vegetarian option with hearts of palm, olives, and cheese, and the sweet Romeo and Juliet, filled with guava preserves and fresh cheese, were more successful. When in doubt, go for cheese. The bobó is thick, creamy, and full of shrimp. 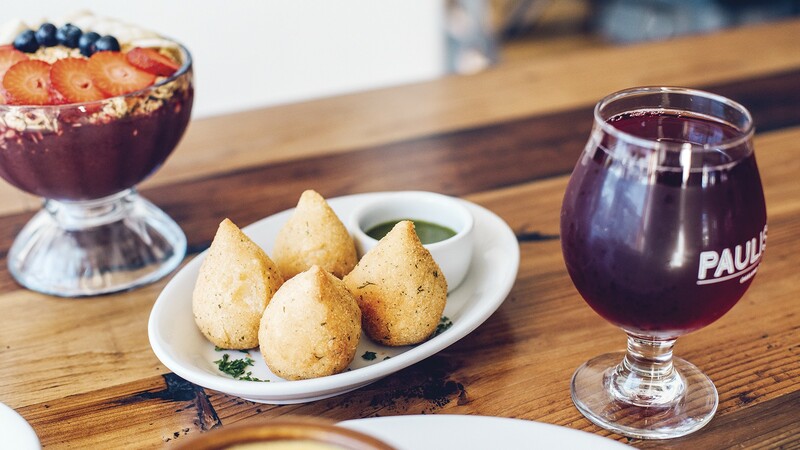 All of the aforementioned dishes make for fun appetizers or beer snacks, but trying to build a meal out of them would get pricey fast — each $3.50 empanada, for example, is about three bites. Among the entrées, the feijoada is likely to be the most familiar to diners. It's often called Brazil's national dish, a comforting stew of black beans, linguiça sausage, beef, and pork ribs served in a clay pot. It's thick, hearty, and just a tad smoky, with the meats nicely braised, and comes with typical sides of rice, collard greens, and farofa, toasted cassava flour. I also enjoyed the bobó and moqueca, two very similar, yellow-tinted seafood dishes full of coconut milk, tomatoes, and bell peppers. I slightly preferred the bobó, a savory shrimp chowder, for its thick and creamy consistency — puréed cassava gives it extra heft. 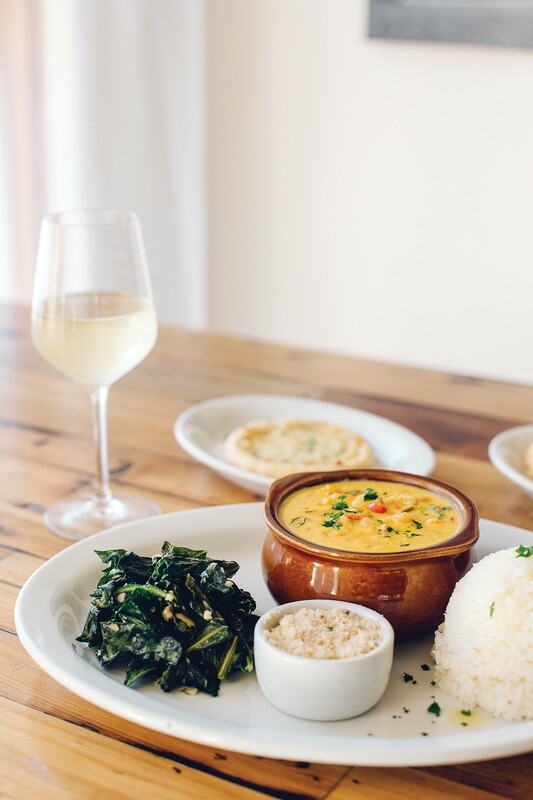 The thinner moqueca comes with shrimp or fish as well as a spoonful of bobó on the side. As solid as both dishes were, I couldn't help but feel like Paulista was holding back, like the flavors could deliver more punch. Sure enough, Yamamoto told me that he uses about a quarter of the amount of unctuous dendê oil (a type of palm oil) as most cooks in Brazil and only a tiny amount of malagueta pepper, which traditionally gives these dishes a bigger kick. He said he doesn't want to overwhelm any palates, but if you desire oomph, you can request more pepper when you order. Even though Paulista is fast-casual with counter service, the staff could use more polishing. Plates were dropped off with no comment or explanation, and it would have been nice to know how to best incorporate farofa in the various entrées, for example. (Yamamoto told me by phone that there's no single correct way, but he recommends sprinkling a little over each bite.) And there was a missing dish that one Paulista food runner insisted we never ordered, but when I checked my receipt back at home, it turned out that I had paid for it after all. Hours: Mon. 7 a.m.–2:30 p.m.; Tue.–Thu. 7 a.m.–10 p.m.; Fri.–Sat. 7 a.m.–11 p.m.; Sun. 8 a.m.–9 p.m.